A recently completed study on the sea otter population along California's central coast appears to be a mixed bag of some measurable increases in numbers since 2010 but a virtual overall stagnation in growth since 2008. Conducted by the U.S. Geological Survey, the study noted a slight increase in the number of sea otters in 2012 but, with a total population estimated at 2,792, it is likely that the sea otter will remain on the Endangered Species Act's "threatened" list. "We're cautiously optimistic that the numbers are up a little bit from the last couple of years, which is great. But we're not going to jump up and down and say the population is skyrocketing again," said Tim Tinker, a University of Santa Cruz professor and overseer of the survey. 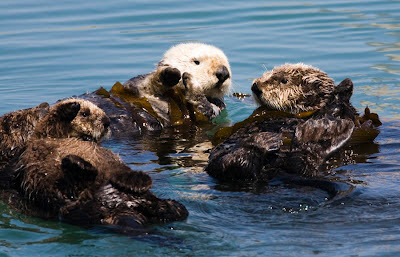 While conservation protective measures can certainly be held responsible for much of the improvement in numbers for a species that was nearly hunted into extinction for its fur, there are possibly several factors at work that could be contributing to less growth that would be desired by many researchers who study sea otters. Pollution, infectious diseases, parasites, and toxic algal blooms are just some of the many threats that scientists are studying. Many of these threats are fueled by man-made activities. However, one threat in recent years, which has contributed to the highest number of deaths in one population group, is not something attributed to mankind: Sharks. With more elephant seals moving into Central California, the great white shark will follow. And that increases the likelihood of sea otters encountering these large predators who might mistake the sea otter for a juvenile seal. In the 80's and 90's, shark attacks accounted for 8 percent of sea otter deaths. That figure has now grown to 30 percent. However, as is often the case with humans, attacks by great white sharks do not result in the sea otter being consumed. Dead sea otters are being found with the obvious marks of a shark bite, but the shark is not finding the sea otter as much of a tasty item as, say, a fat-rich elephant seal. The long-term improvement in sea otter populations is encouraging and the current lull in growth could be a temporary statistical fluctuation. More study is needed to see if all the various potential threats to sea otters are growing. When it comes to shark attacks, this could be nature's way of balancing an ecosystem when there is any shift in another species' growth or decline (as with the growth of the shark's favored prey, seals and sea lions). Nature could work it all out given time. But the man-made threats deserve our immediate attention. "We have been in the dark for over a year about how the sea otter population was doing and feared the worst. Even though this year's count is up, we are still concerned about the overall health of the population following two years of sea otter deaths," said Brad Hunt, program manager for The Otter Project. Said Jim Curland, director of the Carmel-based Friends of the Sea Otter, "In this case the (population) number being up is encouraging, but it doesn't mean we're out of the woods."